I couldn’t resist: when I was very small one of my ‘other’ dreams (pre-cello dreaming days) was to be a pony. Yes. I said, be. Not, have or ride or pet. So when I saw this, I couldn’t resist. Add a Zoe Keating soundtrack and they had me at whinny. 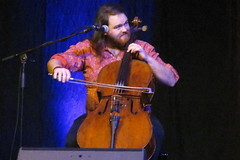 This entry was posted in Cello in action (video) and tagged humor, MLP, movie trailers, Ponies!, videos, zoe keating. Bookmark the permalink.